In 1989, the New York Times published an article describing a landmark event in conservation history. 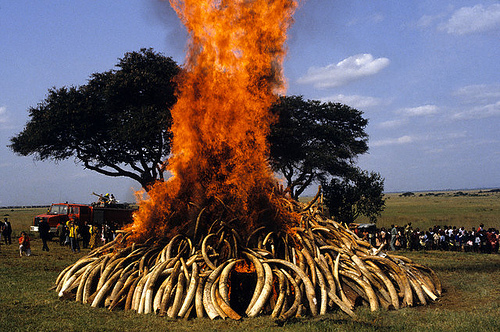 Daniel Arap Moi, then president of Kenya, set fire to 12 tons of poached elephant ivory. With this historic event, the world became aware of the conservation crisis that plagued African elephants. Awareness was raised, action followed, and the slaughter slowed – but did not stop. The trade in ivory was banned the following year. Now, nearly 3 decades later, the number of elephants being killed for their ivory is again reaching historic levels. The ban has been significantly weakened. When following the link above to the New York Times article on the 1989 ivory burning, the page included an ad for mail order ivory products – dated 2012 – which are guaranteed to be legal. The irony is remarkable. African elephants are the largest land mammals, living in multi generational family groups where females form the social core. They may live for 60-70 years, and are widely known to grieve over their dead. Elephants are cognitively complex. Studies demonstrate that they can recognize themselves in a mirror, a mental skill found also (and only) in humans, great apes, and dolphins. Elephants make and use tools, communicate with each other using infrasound (below the range of human hearing), coordinate their movements with other elephant groups over vast distances, and are remarkable problem solvers. Not long ago they roamed across the majority of the African continent. They numbered between 3-5 million in the first half of the 1900’s. Today, those populations have been reduced dramatically, with numbers varying greatly from country to country. It is no exaggeration to say that a conservation crisis is underway for African elephants. 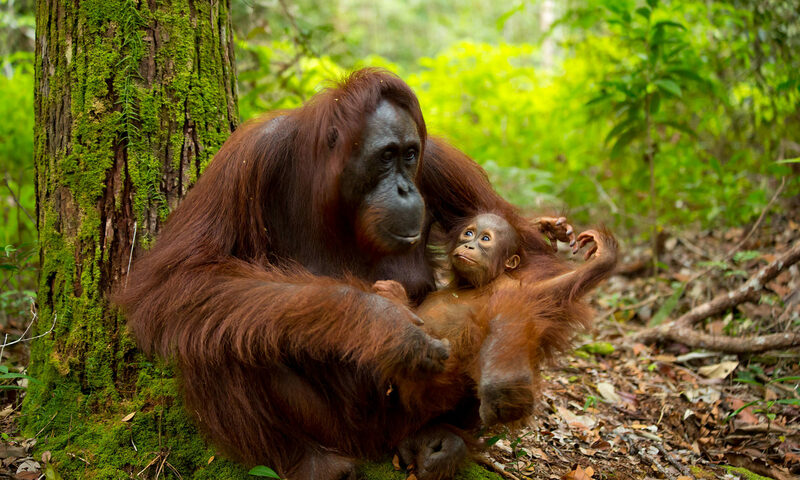 Their future in the wild is uncertain. The biggest threat to their survival is illegal poaching to obtain their tusks, known as ivory. The tusks are actually teeth – incisors that are used by elephants in many ways, such as digging, moving objects, for assistance in foraging, or during social interactions with other elephants. For centuries, humans have used ivory for numerous purposes. Not long ago, it was made into such common items as billiard balls and piano keys – which explains the curious phrase “tickling the ivories” for playing the piano. The current resurgence in the desire for ivory is unsustainable and rapidly driving wild elephants closer to extinction. 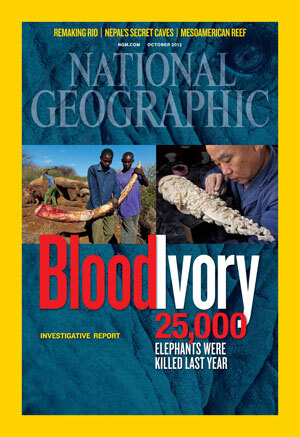 The cover story for the current edition of National Geographic documents the reality of ivory worship. Across the globe, illegal ivory is harvested, smuggled, carved into ornaments, and sold for incredible profit. While many countries are involved, the primary market is Asia where the cultural attachments to ivory appear to be stronger than ever. Some buyers are misled into believing that ivory comes from elephants that die naturally, that tusks are shed and grow back, or that it is all ancient mammoth ivory found buried under ice and snow. Of course, none of this is true. The facts are clear. Ivory requires that elephants be killed. The demand for ivory is strong, and the number of elephants in Africa are declining at alarming rates. Further, the trade in legal ivory facilitates poaching and illegal ivory. As a case in point, NPR correspondent John Burnett has detailed the decimation of Tanzania’s elephant herds that is underway. Only last week, 4 tons of illegal elephant ivory were confiscated in Hong Kong. 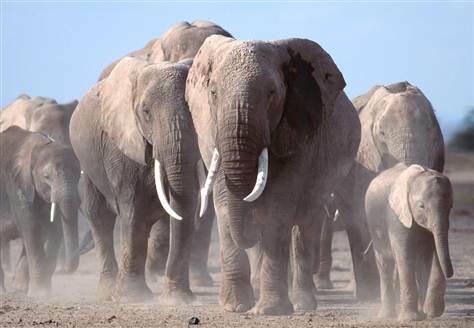 Officials believe that the shipment included tusks from Tanzanian and Kenyan elephants, and was headed for carvers in China, which remains the world’s largest consumer of ivory products. Importantly, this confiscation was supported and conducted by Chinese officials. These individuals are not alone. 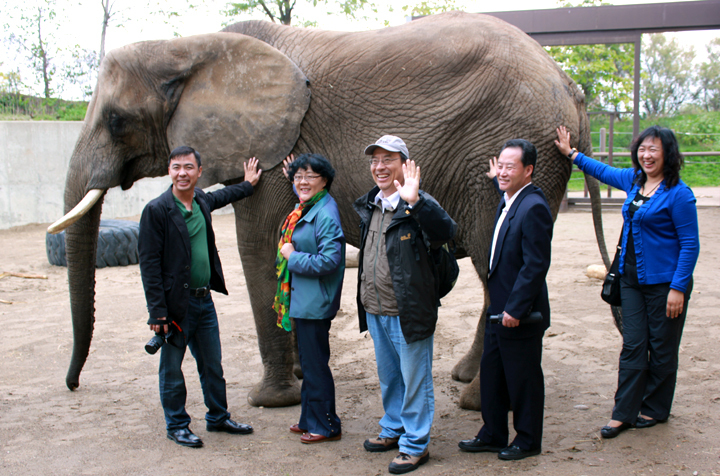 The China Wildlife Conservation Association (CWCA) has a membership of over 30,000 Chinese people who are working to protect and preserve China’s wildlife, change cultural attitudes about ivory, and end the slaughter of African elephants. A delegation from the CWCA recently visited the Indianapolis Zoo to describe their work and discuss the future for African elephants. They are taking on a massive task, namely to provide an “ecological and moral education” to the young people of their country. While China has specific laws against the illegal trade in ivory, enforcement is difficult. As a start, every flight coming into China from Africa has enhanced inspections to discourage and prevent illegal ivory from entering the country. Punishment is very serious – ranging from 5-20 years in jail. To be sure, enforcing existing laws and changing cultural attitudes is a massive task – and it requires international support. The dedicated conservationists from CWCA provide a ray of hope and remind us that there is room for optimism. In the 1980’s, the world rallied around elephants and stopped the slaughter. But, we’re facing another conservation crisis today, perhaps on an even larger scale. Recent attention from major media outlets is an important and appropriate step forward, momentum has begun. Learn more about elephant conservation organizations and give them your support.